“Teen Choice 2018” honors stars from film, TV, music, fashion and comedy; “Worst Cooks in America” serve up their best. 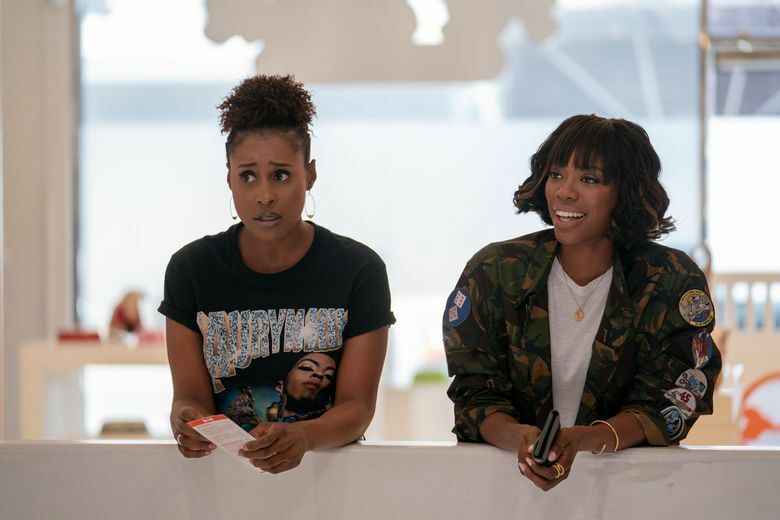 Season-three premiere of comedy whose star and creator, Issa Rae, is nominated for a lead-actress Emmy for her work in season two; after losing her apartment, Issa crashes on her ex’s couch, deals with an unsatisfying work situation and has to reinvent herself as she and her young-adult friends deal with relationships and life’s insecurities; 10:30 p.m. Sunday on HBO. “The History of Comedy,” 7 p.m. (CNN): Comedy duos past and present, including Abbott and Costello, Cheech and Chong, Dean Martin and Jerry Lewis, and Tina Fey and Amy Poehler; repeats at 10 p.m.
“Teen Choice 2018,” 8 p.m. (KCPQ): Honoring the year’s stars from film, TV, music, fashion and comedy, hosted by Nick Cannon and Lele Pons; scheduled performers include Khalid, Lauv and Meghan Trainor. “Celebrity Family Feud,” 8 p.m. (KOMO): Usually tops in Sunday ratings; celebrity battles with host Steve Harvey, featuring professional football players Emmitt Smith and Todd Gurley II and actors Craig Robinson and Casey Wilson. “Fear the Walking Dead,” 9 p.m. (AMC): Midseason premiere; in the continuing aftermath of the zombie apocalypse, Morgan tries to help Alicia and the fractured group of survivors as a storm brews. “Claws,” 9 p.m. (TNT): Season-two finale; as a hurricane bears down, Desna proceeds with her plans; opposing forces converge at a lavish golf resort, each determined to prevail against the others. “Keeping Up With the Kardashians,” 9 p.m. (E! ): Kim and Khloe try to get to the root of Kourtney’s bad attitude; Khloe and Scott formulate a plan to prove Kris isn’t the art expert she claims to be. “Worst Cooks in America,” 9 p.m. (FOOD): Season 14 premiere; a group of terrible cooks enter culinary boot camp and make their signature dishes, with disastrous results; the recruits learn to make a surf-and-turf dish. “Ballers,” 10 p.m. (HBO): Season-four comedy-series premiere; financial manager Spencer Strasmore (Dwayne Johnson) and his partner relocate from Miami to L.A. to drum up business.